wanderlust ATLANTA: ATLANTApix: Is That Dome Real Gold? 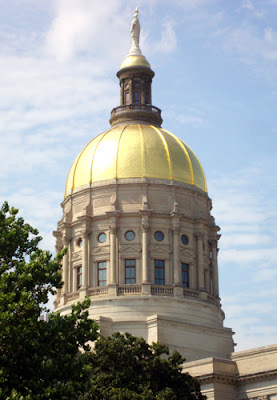 One of the most commonly asked questions of Atlanta architecture is specific to one of our most remarkable and easily identified landmarks...the Georgia State Capitol Building, specifically, its gold dome. Is the dome made of real gold? The answer is of course, "Yes." But it wasn't always gold. It was originally white (1889) and many years after construction it was gilded in gold leaf (1958).